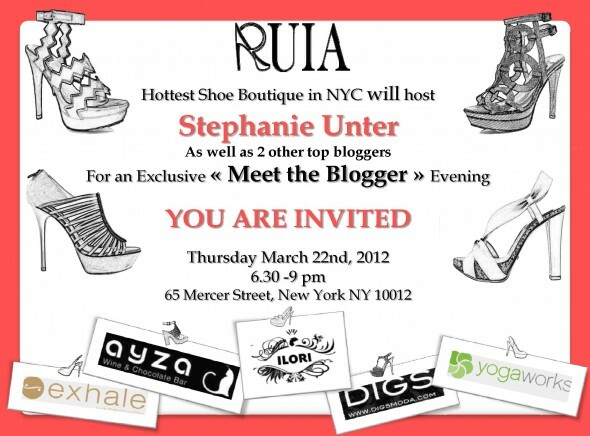 Thursday evening of this week I will be dancing to the tunes of getting to know the bloggers (me included), shoe shopping, major discounts, having delicious libations, and nibbling on chocolate. The fashion forward boutique, Ruia, has requested my presence (lucky me) for a fun-filled night of playing dress-up–a girl’s dream come true. Ruia, at just over a year old, carries an exclusive line of European shoes not to be found anywhere else — a rare commodity these days. I had the pleasure of stopping by last week and the shop really reminds me of a small exclusive Parisian boutique in the heart of Soho. So come say “hi” now that we are really getting to know each other. Figure its an evening out where you get to ask me whatever you want. Drop me a comment, send me a tweet, let me know if you are coming. Regardless, lots of fun will be had and I wouldn’t want you to miss out come March 22nd. And, remember shoes can make or break your look. Ruia. Hope to see you Thursday! oh mannnn I wish I was home in NYC for this! 🙁 looks like a great event! What a great job you did explaining how you work and put things together… inspiration, insight and in your eyes!